Jordan Morris was already playing regularly for the USMNT while still in college. Though that might have been common in an earlier era of the US National Team, Morris was doing it in 2014. Stanford soon gave way to the pros, with Seattle signing Morris as a Homegrown Player for the 2016 season. Morris was a winner with Stanford, finishing with a College Cup and the Herman Trophy. That carried over to his first season in MLS, with Morris winning the Rookie of the Year award and MLS Cup. 2019: Started against Ecuador on Mar 21 and subbed on against Chile on Mar 26. 2018: Started the January friendly against Bosnia and Herzegovina. 2017: Subbed on against Serbia on Jan 29. 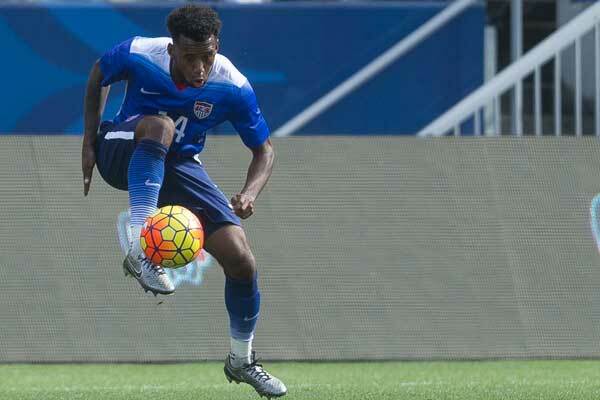 Started against Jamaica on Feb 3 and scored the game winner. Subbed on against Venezuela on Jun 3 and Ghana on Jul 1. Subbed on against Panama on Jul 8 in the Gold Cup opener. Started against Martinique on Jul 12 and scored two goals. Subbed on against Nicaragua on Jul 15 and against El Salvador on Jul 19. Started the Jul 22 semifinal against Costa Rica. Started the final against Jamaica on Jul 26 and scored. Subbed on against Costa Rica in the Sep 1 World Cup qualifier. Started against Honduras on Sep 5. 2016: Subbed on against St Vincent and the Grenadines on Sep 2 and Trinidad & Tobago on Sep 6. Subbed on against Cuba on Oct 7. 2015: Scored against Mexico on Apr 15. Became a regular in Klinsmann's squads. 2014: Made his USMNT debut on Aug 28 against the Czech Republic. 2017: Finished 2nd in the Western Conference and advanced to the MLS Cup final. 2016: Joined the Seattle Sounders as a homegrown player. Morris's father is the team doctor for the Sounders and he played for their youth academy and U-23 team. Won the Rookie of the Year award and MLS Cup,. High School and College: Played his high school soccer at Mercer Island while also appearing for the Eastside FC B94 Red team and the Seattle Sounders academy. Played collegiately for Stanford, winning the Pac-10 title in his sophomore season. As a junior, Stanford won the College Cup with Morris picking up the Hermann Trophy as the country's top college soccer player.